On December 24, Nobel Laureate Harold Pinter died in London at the age of 78. A.C.T. Artistic Director Carey Perloff—a longtime friend and collaborator of the playwright—reflected on the life and work of a man who revolutionized modern theater in yesterday’s issue of the San Francisco Chronicle. A.C.T. deeply mourns the passing of this great artist. Our best to all of you in the New Year. I have always seen a lot of myself in the title characters of comic strip classic Calvin & Hobbes, but I admit it’s been a long time since I had Calvin’s allergy to school. Trapped by cartoon magic perpetually in first grade, Calvin would agonize over every last second before the bell’s ring released him from his Sisyphean misery. Not me. I am much more Susie Derkins, Calvin’s nerdy nemesis: always cut short mid-thought by the same bell, reading during recess, arriving early, and staying late. It’s an illness. It is because I am sick that I find myself, as I write this from Morning Due Café on Church Street, a little shell-shocked to be at the end of my first semester as an M.F.A. student at A.C.T. What am I supposed to do for three weeks? I am having separation anxiety. Monday, the day off from the show, the theater is dark and we don’t have class. Phew. It’s a day to recover from a nine-show opening week that ended with four shows in two days. It’s also our last day off until Christmas Day. We’re about to embark on a nine-day, thirteen-show stretch that has us all secretly wondering if our bodies can hold up. It’s hard to embody the Christmas spirit so many times in so few days! Also, I don’t think any of us M.F.A. students has ever had such a concentrated stretch of shows. For the first two years in the M.F.A. Program, our projects usually got about four final performances. In our third-year Zeum shows we get about five shows a week for three weeks. 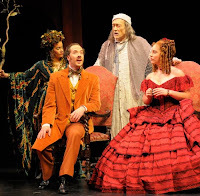 So moving up to eight or nine shows a week with A Christmas Carol is quite an adjustment, and we’re all learning what it takes to keep our performances consistent and alive. Wednesday, November 26, the day before Thanksgiving 2008, 3 p.m.
A group of us are gathered around Carly Cioffi’s desk on the sixth floor at 30 Grant, just outside Carey’s office. Greg, Carly, Vinny, Deborah, Caresa, Heather, Carey, Tom, and me. We’ve just popped open a bottle of Prosecco Vinny has provided, clinked glasses, and toasted to completing the casting for Rich and Famous. A festive moment, wouldn’t you say? Little would the casual observer appreciate the first deep breaths I’m inhaling in days. We have just received a “yes” from the last actor to join what is a fabulous cast, which is a wonderful moment. The excitement comes from the fact that the show in question starts rehearsal a mere 12 days from this moment.